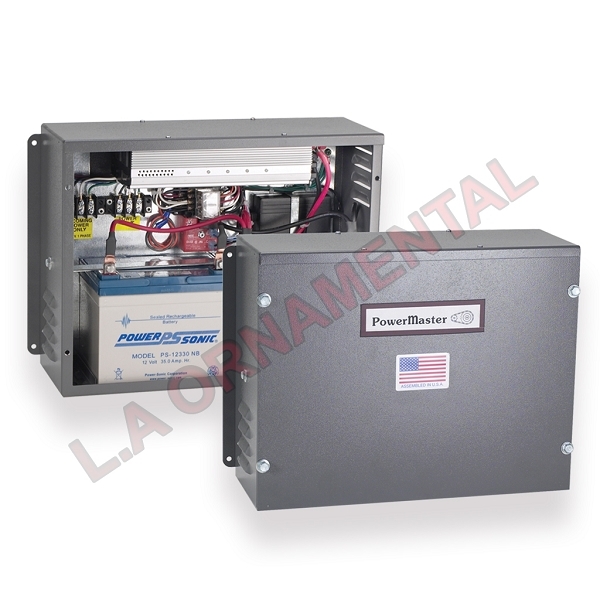 Designed to provide 120 VAC power to any powermaster operator with a ½ HP PSC motor, when the main power source fails. All connected accessories and safety functions are powered by the SPS, allowing for normal operation during extended outages and maintaining the operators UL325 and 991 compliance. Powder coated galvanized steel weatherproof vented enclosure. Separate guarded terminal connections for incoming power supply and output power to operator. 1000 watt at 120 VAC, 60HZ standby power output offering the advantage of multiple operations during a main power outage. Automatic change-over to standby power when main power source fails. Time delay on switchover to standby power to avoid unnecessary battery drain. Integral 3 amp. Charger with charge status indicator to keep batteries fully charged. Optional wiring for open only operation when power fails 9 (One time hold open). Built-in audible low battery alarm. Two 35 AH batteries included.